If you liked seafood or 'scampi' dishes in your pre-vegan days, you're in for a real treat with this dish. Oyster mushrooms certainly live up to their name. They smell and taste like seafood! Part of my "New Years Resolution" is to expose myself to new ingredients and oyster mushrooms were this weeks pick. I wanted to make a 'scampi' with the mushrooms but was out of linguine or spaghetti (I used sprouted whole wheat pasta - pictured) and had to work with what I had. This dish is so easy but simply wonderful and would make for a lovely romantic dinner. A healthy, vegan version of seafood scampi. You can also add a splash of white wine during cooking for a more authentic dish. Cook mushrooms in 1/2 cup broth over medium heat. After 4 minutes, add parsley, garlic, lemon, miso and kelp. Cook until mushrooms are soft and fragrant, adding more broth as needed to prevent burning and drying out. Once mushrooms are cooked, add more broth so there is enough to line the bottom of your pan. 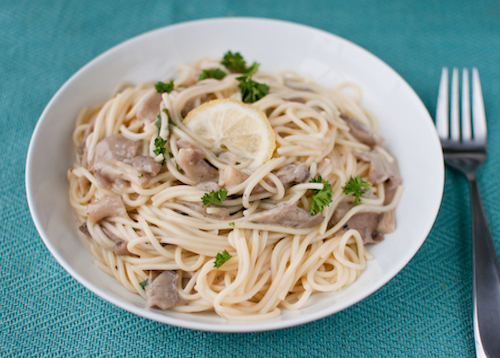 Toss mushroom mixture with cooked pasta and garnish with parsley.